A number of complaints came to light recently from iPad Pro owners who were unhappy to discover that their expensive Apple tablets were bent. Apple responded to these complaints by saying that the iPad Pro's unibody design "meets or exceeds" all of its high standards. Now the company has gone further, publishing a support page explaining the manufacturer and testing process of the iPad Pro, and explaining that the way the tablet is made is the reason some people see a bend. Apple insists, however, that a bend should be within a tiny 400-micron tolerance. The support article is entitled iPad Pro unibody enclosure design, and on it, Apple explains "how the enclosure is made and tested". As we have discerned from complaints, it is the LTE version of the iPad Pro that is particularly susceptible to an unwanted bend, and Apple says -- as it has done before -- that this is because of the cooling down of materials used in the casing. iPad Pro cellular models now feature Gigabit-class LTE, with support for more cellular bands than any other tablet. To provide optimal cellular performance, small vertical bands or "splits" in the sides of the iPad allow parts of the enclosure to function as cellular antennas. For the first time ever on an iPad, these bands are manufactured using a process called co-molding. In this high-temperature process, plastic is injected into precisely milled channels in the aluminum enclosure where it bonds to micro-pores in the aluminum surface. After the plastic cools, the entire enclosure is finished with a precision CNC machining operation, yielding a seamless integration of plastic and aluminum into a single, strong enclosure. 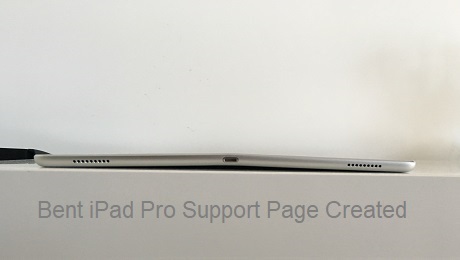 Few people who have a bent iPad Pro will particularly care about why it is bent, being primarily concerned about the fact that it is bent. Apple insists that the "new iPad Pro models meet an even tighter specification for flatness than previous generations", and when it comes to the "flatness specification", there should be "no more than 400 microns of deviation across the length of any side", or -- as the company explains -- "less than the thickness of four sheets of paper". The new straight edges and the presence of the antenna splits may make subtle deviations in flatness more visible only from certain viewing angles that are imperceptible during normal use. These small variances do not affect the strength of the enclosure or the function of the product and will not change over time through normal use. This last sentence may well be true, but the fact that numerous people have complained about perceiving a bend means that users clearly see this as more of a problem than Apple does. A tolerance of 400 microns may sound like very precise workmanship, but people are noticing the problem nonetheless.